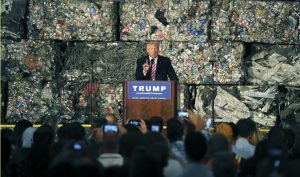 MONESSEN, Pa. — Donald Trump called for a new era of economic “Americanism” Tuesday, promising to restore millions of lost factory jobs by backing away from decades of U.S. policy that encouraged trade with other nations — a move that could undermine the country’s place as the dominant player in the global economy. In a 35-minute address, Trump threated to exit the more than two-decade old North American Free Trade Agreement and vowed to withdraw from the Trans-Pacific Partnership, an agreement among 12 Pacific Rim nations that has yet to take effect. He blamed many of America’s economic woes on China, promising to label the country a currency manipulator and slap new tariffs on America’s leading source of imports, a decision with the potential to dramatically increase the cost of consumer goods. The speech marked a significant break from years of Republican Party advocacy for unencumbered trade between nations, and drew immediate condemnation from GOP business leaders. Trump blamed the policies of Democratic rival Hillary Clinton and her husband, former President Bill Clinton, for the loss of millions of manufacturing jobs. But many economists have dismissed Trump’s promise to immediately restore manufacturing jobs as dubious at best, given the impact of automation and the many years it typically takes to negotiate trade agreements. In making his case for a new approach to trade, Trump recounted economic policies in place at the founding of the country — a time when goods traveled by horseback and schooner, the invention of the telegraph was still decades away and the advances of the Internet and broadband communication hardly imaginable. The billionaire real estate mogul then skipped ahead to the 1990s, blaming the Clinton administration for negative impacts of globalization. He cited Bill Clinton’s support of NAFTA, which aimed to reduce barriers to trade between the U.S., Canada and Mexico, and China’s entry into the World Trade Organization. He challenged reporters to ask Hillary Clinton if she would be willing to denounce the Trans-Pacific Partnership on her first day in office and unconditionally rule out its passage in any form. “Throughout her career — her whole career — she has betrayed the American worker. Never forget that,” Trump said. She now says she will back trade deals only if they fulfill a three-pronged test of creating “good jobs,” raising wages and improving national security. But Tuesday’s speech drew a scathing response from the U.S. Chamber of Commerce, a traditional Republican ally and leading business lobby. Democrats, meanwhile, didn’t wait for Trump to start talking before they jumped in to slam his ideas, detailing all the products his companies make overseas in a conference call with reporters. Lerer reported from Washington. Associated Press writers Ken Thomas and Josh Boak contributed from Washington.